Okay, it’s actually 15 days, but fifteen seems like such a big number. Two seems incredibly small. And yet there is so much to do! Yesterday, my wife and kids and I formed an assembly line to turn out the souvenirs for the book launch at University Books in Seattle on August 24th at 7:00 PM. (Just in case you forgot where and when this grand celebration will be). Parking is off NE 43rd St and I believe it’s free for those who buy a book (even if it’s not mine). I’ve got door prizes as well that should fit in with the party’s theme. There will be some special guests, and a couple of other big surprises for those in attendance. If you’re coming and plan to buy a book (or two), please arrive early so you can pay for it before the main event starts at 7:00 PM. The cash registers will be closing at 8:00 PM, but the signing will go on until my hand gives out (or we run out of books). The bookstore asks that you pay for the book before you get in line for the signing. Summer has gone by so fast this year. A few weeks ago, I attended the Pacific Northwest Writer’s Association Conference and had a wonderful time. I moderated three sessions and helped out with the agents and editors pitch blocks. As a volunteer, you get to meet so many amazing people. Everyone was so supportive when they heard my launch was coming up in August. 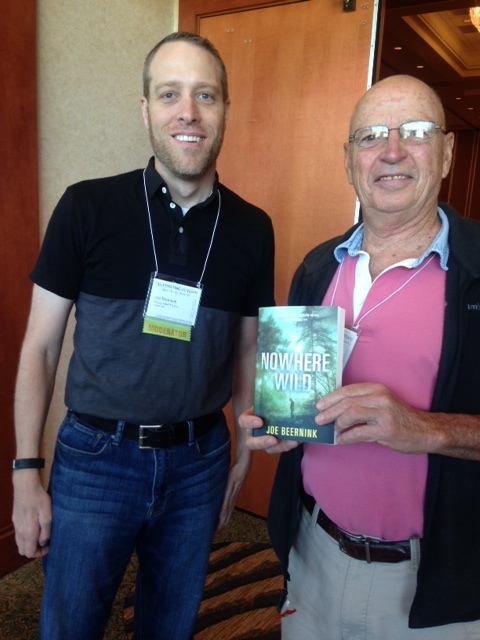 We did a door prize prior to the Editor’s Panel, and gave away my first signed copy of a Nowhere Wild ARC. I’m still trying to track down the person who took the picture. If I find it soon, I’ll update this post. After the PNWA, I participated in a 3 day hackathon on the Microsoft campus. For those of you who don’t know what a hackathon is—don’t worry—I didn’t either until a couple of years ago. You get a few thousand developers and project managers and designers and marketing and other employees together for three days, and you give them the opportunity to either solve a problem using the skills they’ve learned throughout their career, or a new skill they want to develop. The problems range from process issues at the company, to ecological challenges faced by the world, to medical issues that technology can address, to changes to existing products to give the products abilities the product teams don’t have time to build out during the regular product cycles. I worked on a project trying to help people with visual and hearing impairment. I can’t say what it was, due to non-disclosure agreements, but I can say that I had an awesome time, and what we were able to do in just 51 hours was astounding. We worked long hours, and kept the pedal to the metal, and our product exceeded my expectations. I hope, someday, that what we built will be refined and made available to vision and hearing impaired people around the world. Since the end of the hackathon, I’ve turned my attention back to writing and prepping for the Nowhere Wild launch. I’ve picked up the laptop again, and have gotten back into the groove of writing each morning before work. That is, I go to work ridiculously early, then sit in a lounge and write for an hour each day before going to my office. It’s kind of like the old days where I wrote on the train, but not quite as regular, and I don’t have time to write in the afternoon on the way home (since I’m driving). Once I get deeper into this book, I hope that I can improve my daily output and write in the evening as well. The other thing I have also picked up this summer is my reading pace. A few years ago, I read two books a week. Then I went through my Guillain-Barre issues, and I couldn’t read at all. Now, I’m trying to read every day. Some of my recent reads include (that I would recommend) The Martian by Andy Weir, The Perks of Being a Wallflower by Stephen Chobosky, and My Sister’s Grave by Robert Dugoni. My brother-in-law, Gary, recommended that I listen to Ready Player One on audible, narrated by Wil Wheaton, and I’m so glad I did. It was the first audio-book I’ve listened to end-to-end, and I loved it. I highly recommend that anyone who grew up in the 1980’s playing video games listen to that book. I’m going to go back and read it again someday soon, but listening to it on my drive to and from work made the commute fly by, to the point that I sometimes hoped for traffic jams so I could listen to more of the story. This is already getting to be a bit of a long entry, so I’ll cut it off here. I hope to have more time to blog in the next few weeks (there will be so much going on!) but I’m not sure I’ll be able to do it (because there will be so much going on!) I’ll post updates whenever I can. Now, it’s time to get back to reading. Or may be writing. Or planning. Marketing? So much to do!